November 29, 2017 By Yoanne Clovis, Ph.D.
As a technical scientist, I routinely screen mutant C. elegans strains to detect phenotypic changes. To measure the various parameters of feeding behavior and detect subtle changes, I immobilize my worms in a microfluidic channel while stimulating feeding. 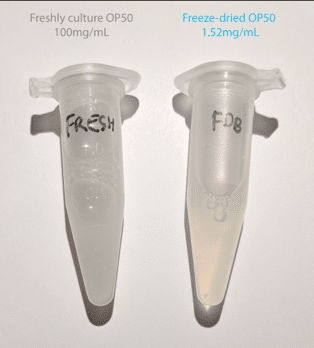 Last summer, I tried out the Labtie freeze dried OP50 bacteria as a food source to use in such experiments, and it turned out that the formulation available at that time was not at all suitable for microfluidics use. The OP50 was hard to resuspend, creating clumps of bacteria that clogged my microfluidic chips. Since then, LabTie has reviewed their production process to address various issues brought up by researchers who tried using these freeze-dried bacteria. They sent me a sample of the new formulation, so I gave it another shot. My goal is to use these freeze-dried bacteria as a food source for my worms inside a microfluidic channel and see whether they elicit a feeding response similar to freshly cultured OP50. LabTie has fixed its freeze-dried OP50 formulation. It is easy to resuspend without clogging my microfludic chips. Freeze-dried bacteria elicited a sustained pump frequency over time. A previous (unpublished) study by Dr. Janis Weeks from the University of Oregon shows that the pharyngeal pumping frequency of C. elegans reaches a plateau around 3Hz when the worms are exposed to OP50 at OD600 2 to 5. Based on this data, I usually dissolve a 100 mg air-dried pellet of fresh bacteria in 1 mL of M9, which corresponds to an OD600 of about 3. I incubate starved adults in bacteria for 7 minutes prior to recording. I then record each worm for about 2 minutes for a total duration of 60 minutes. I repeated this process on 3 different days and obtained the graph below (figure 1). Figure 1: Pharyngeal pumping frequency over time as elicited in Day-1 adult C. elegans. Worms tested with OP50 bacteria were starved for 2 hours on a plate prior to 7-min incubation in freshly cultivated OP50 (100mg/mL). 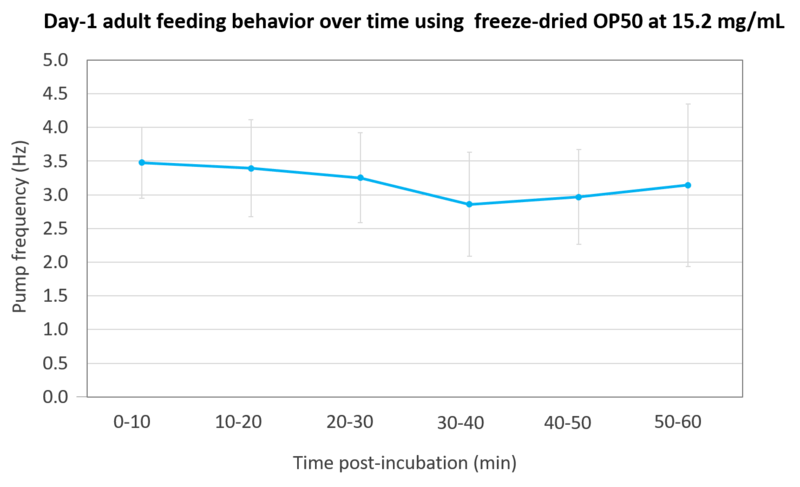 LabTie’s protocol suggests to resuspend half a vial (380 mg) of OP50 in 250 mL of water for use in a microfluidics channel. However I only need 2 mL of OP50 per experiment, so I used LabTie’s suggested concentration for microfluidics use and rehydrated 1.52 mg of freeze dried OP50 in 1 mL of water. This is a much lower concentration than the one that I usually use, but I figured I’d try to follow LabTie’s protocol before messing with it…and I am glad I did. I tested both food sources in parallel on Day-1 adult C. elegans, as I described above. Figure 2: Epitubes containing 1ml of fully resuspended OP50. Bacteria on the left were cultured overnight on nutator at room temperature the day prior to experiment, pelleted, air-dried for 30 minutes, then resuspended in M9. The freeze-dried bacteria (right) were weighed and resuspended in water minutes prior to use. The first good surprise was how easy it is to completely resuspend the bacteria. It just takes a couple of vortexing rounds to obtain a clump-free solution. I have yet to measure the OD600, but the difference is clearly visible (figure 2). Surprisingly, instead of exhibiting a lower pump frequency compared to fresh OP50-fed worms (figure 1) as I was expecting, the worms fed with freeze-dried bacteria pumped at frequencies above 3 Hz (figure 3). 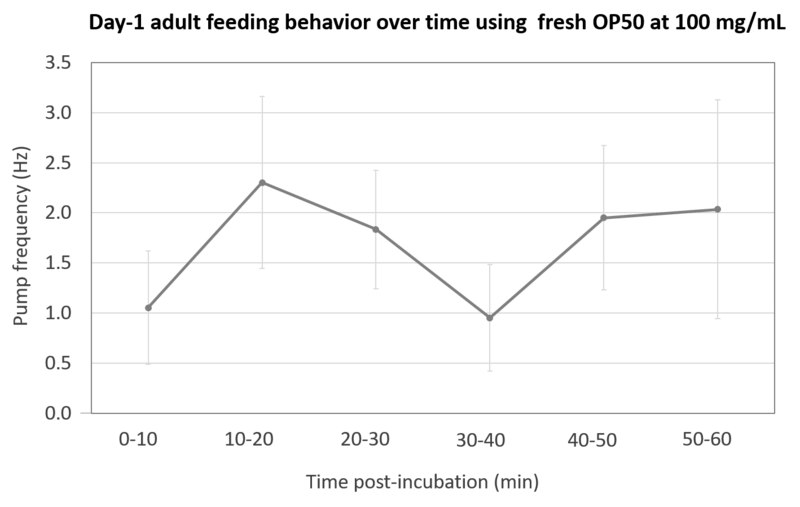 The second unexpected result was that freeze-dried bacteria elicited a sustained pump frequency over time, whereas pump frequency tends to periodically drop below 1 Hz for worms fed with fresh bacteria (figure 2). Figure 3: Pharyngeal pumping frequency over time as elicited in Day-1 adult C. elegans. Worms tested with OP50 bacteria were starved for 2 hours on a plate prior to 7-min incubation in freeze-dried bacteria (1.52mg/mL, blue). Of course, the first explanation that comes to mind is the ~100-fold difference in bacteria concentration between the two conditions. Could the drops in pump frequency be reflective of satiety in worms exposed to a high concentration of OP50? I am also interested in understanding whether the discrepancy in pump frequency is correlated to food quality (absence of contaminants, for example). Either way, this a very good start and I am very excited to continue the characterization of the effects of freeze-dried bacteria on feeding. Now that I know that they resuspend nicely without clumping, it is crucial for me to create a dose-response curve. The reason is that I often need to detect a change in feeding behavior as a response to drug exposure or genetic mutation. In that context, I need to determine the optimal concentration of food that will allow me to detect an increase or decrease of pump frequency. Therefore, knowing how to control the initial pump frequency is quite important for proper experimental design. Overall, I am pretty happy with this new formulation of freeze dried OP50. When studying behavior, especially feeding, the importance of a highly controlled food source cannot be overstated. It is crucial to ensure data reproducibility. I am currently collaborating with Dr. Weeks to create such a dose-response curve. I will keep you posted!